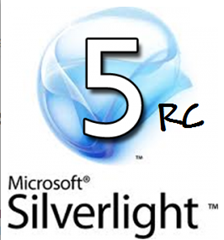 Today the release candidate of Microsoft’s Silverlight 5 was released to the public. 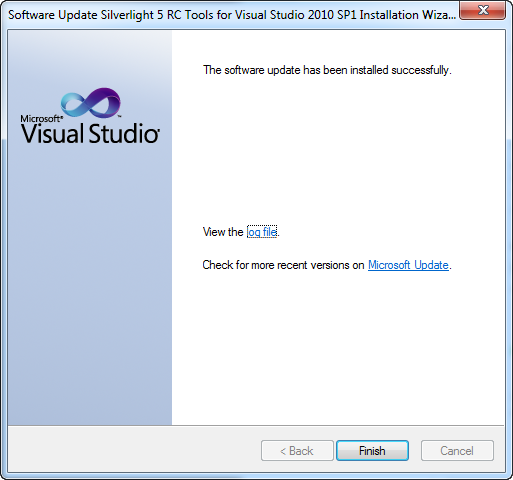 If you want to know “What’s new in Silverlight 5” then check out this page on Silverlight.net and continue reading the article below. 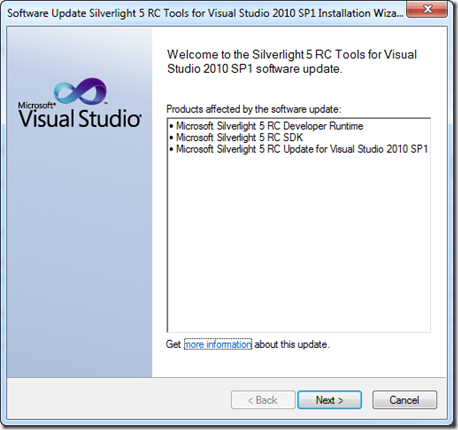 First we are going to need to download the required tools to install the Silverlight 5 RC. Before getting started please note that you can install the Silverlight 5 RC on top of the final release of Silverlight 4. 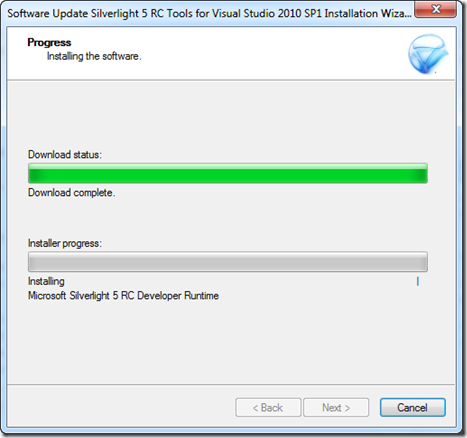 If you have the Silverlight 5 Beta installed then you might want to go ahead and remove those first. 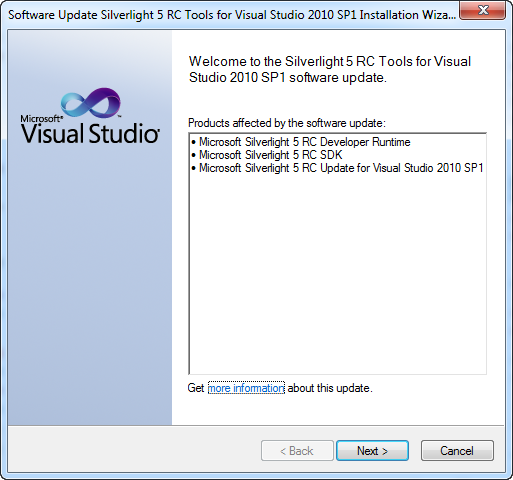 Visual Studio 2010 SP1 or Visual Web Developer Express 2010 SP1 is required to develop a Silverlight 5 RC Application. After you have installed VS2010 SP1 or Visual Web Developer Express 2010 SP1 then you will need to download and install the Silverlight 5 (Release Candidate) Tools for Visual Studio 2010 SP1. If you want a direct link to the files then you can click here. 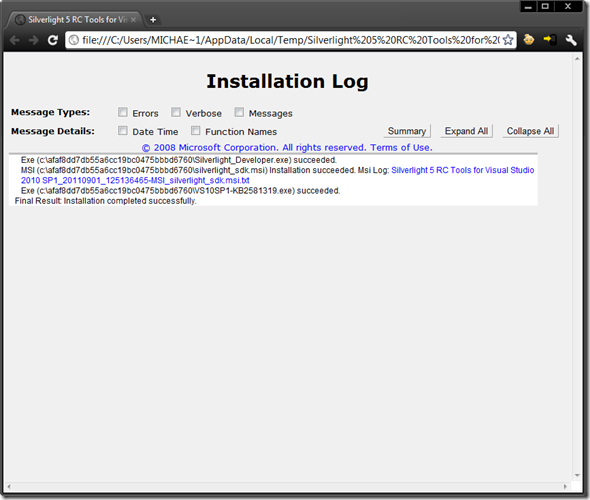 There are also a couple of optional files you can install at this point. They are not required as long as you followed my guide so far. 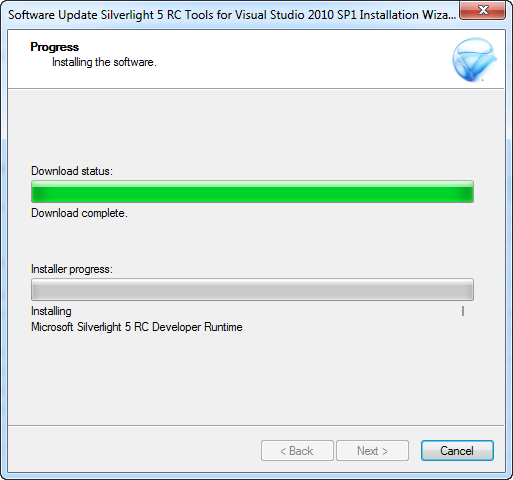 Most of these tools are automatically installed when you installed the Silverlight 5 Tools. 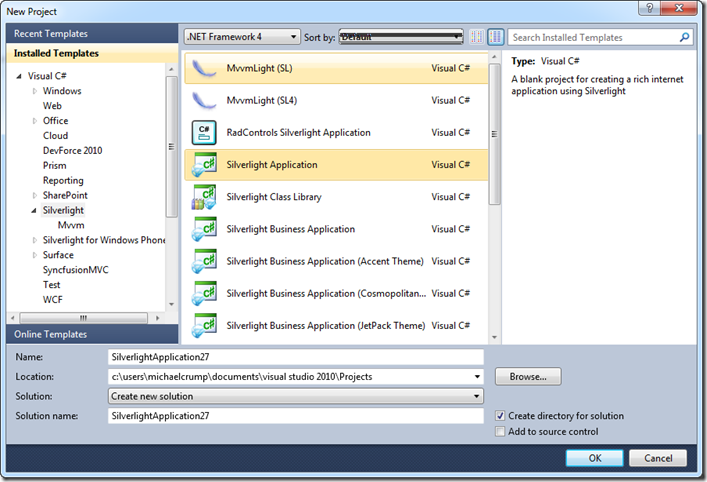 PS: Lots of other great Silverlight 5 links are at the bottom of this post! 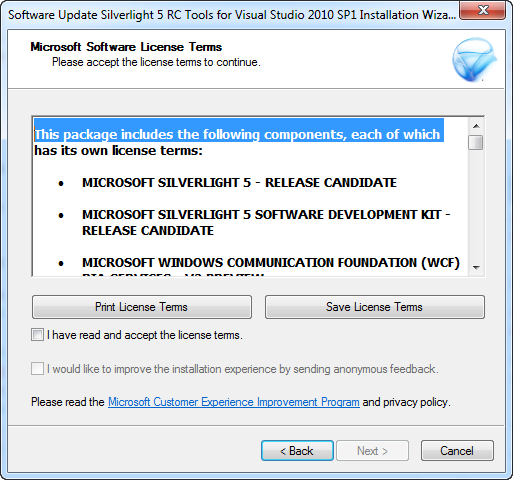 This is going to install the required software to build Silverlight 5 Application. You can go ahead and click the “Next” button. I suggest placing a check in both checkboxes if you agree to send anonymous feedback of the installation experience as I believe it will help Microsoft improve the final release. Go ahead and click the “Next” button. At this point the program will begin installing the required files. 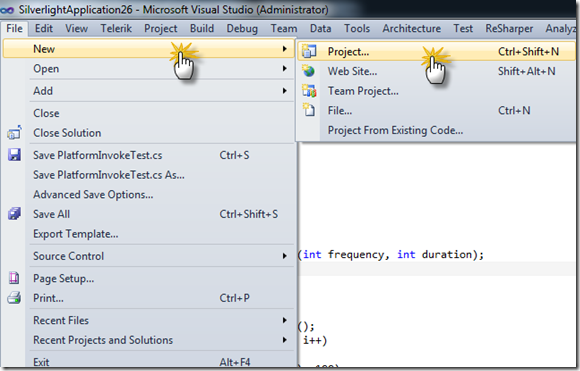 You can now load Visual Studio 2010 Service Pack 1 or Visual Web Developer Express 2010 Service Pack 1. 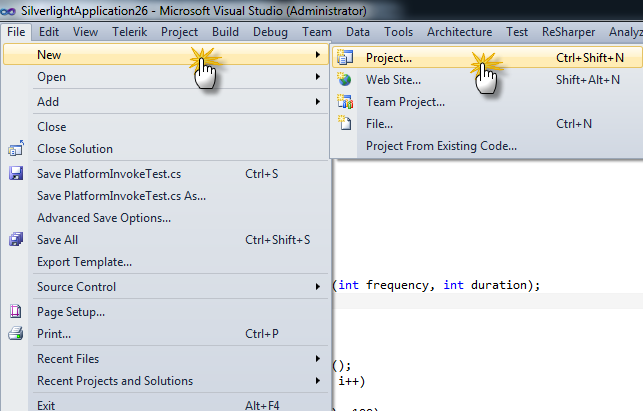 Once you have it loaded go ahead and click “File” then “New Project”. 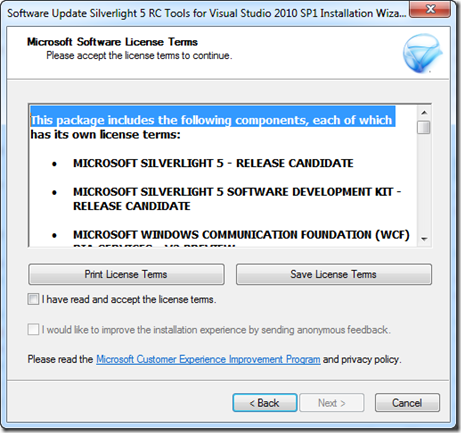 Go ahead and Select “Silverlight Application” and give it a name to continue.